Winter hardy to USDA Zones 10-12 where it may be grown in medium to wet soils in full sun to part shade. Plants tolerate close to full shade. They are best sited in locations protected from strong winds. Plants grow well in areas that are flooded for part of the year. If grown away from water bodies, plants need consistent moisture. Houseplants perform best in bright light with moderate but even moisture. 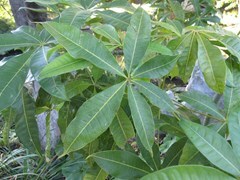 Pachira aquatica is known by a large number of common names including water chestnut, Guiana chestnut and Malabar chestnut. In addition, it is often commercially sold as a houseplant or bonsai under the name of money tree or money plant. In the wild, this is a tropical evergreen estuarine species that is native to freshwater swamps, estuaries and river banks in tropical rainforests from Mexico to northern South America. It is cultivated in Hawaii and southern California. It is typically grown outdoors in frost-free climates as a tropical ornamental and/or for harvest of its edible nuts. In cooler climates, it is often grown indoors as a foliage houseplant (rarely flowers) or bonsai, often in a braided trunk form. Water chestnut is an evergreen tree or large shrub that will grow to 60' tall in its native habitat, but usually smaller (to 30') in home landscapes. Houseplants typically grow to 6-8' tall. Each palmately compound leaf has 5-9, elliptic to lance-shaped, shiny green leaflets (to 5-10" long). Large, greenish to yellowish-white flowers feature five long cream-colored petals surrounding 200-250 tightly-packed, red-tipped stamens (to 3-4" long). Bushy stamens have a shaving-brush like appearance. Flowers bloom for one day and are fragrant at night. Fruit is a heavy, woody, brown capsule (to 12" long) that bursts when mature to release edible nuts (seeds) which may be eaten raw or roasted or ground into flour. Young leaves and flowers may be cooked as a vegetable. Genus name comes from the native Guyanese name. Specific epithet means growing in or near water. Common name of money tree comes from an old tale in which a poor man acquired wealth by discovering this tree and selling its seeds. Under Feng Shui teachings, money tree is believed to bring good luck to those who plant it in their home or office. Roasted nuts reportedly taste like chestnuts and plants grow in water, hence the common name of water chestnut for this plant. No serious insect or disease problems. Plants will drop leaves if soils become dry. Interesting tropical plant for frost-free areas. Foliage houseplant. Bonsai.